Do Cats Need Fiber In Their Diets Like We Do? Would a Lot of Fiber in Food Help Your Cat Slim Down? Fiber is something that often pops up in human food. Doctors recommend people to eat more fiber to prevent diabetes, ease digestion, lost weight, and so on. Fiber, unlike proteins and fats, is not a nutrient. Fiber refers to parts of food, mainly from plants, which are not digested and absorbed into the body. If fiber is not a nutrient, when why do people and some animals need it? In people, fiber helps digested food move through the colon. It helps keep the human colon clean and prevent constipation. There are two types of fiber: soluble and insoluble. Soluble fibers dissolve in water inside the body and become a gel-like substance. Soluble fiber helps the colon draw water and adds texture to stool. Insoluble fiber is what adds the bulk to stool. Insoluble fiber can help prevent constipation and diarrhea. This type of fiber can prevent impaction, which is a fatal condition where stool gets stuck inside the colon. We know why we need fiber: mainly to easy digested food through the colon. Fiber functions the same way in dogs. But do cats need fiber just as we, and dogs, do? Cats are obligate carnivores. It means that cats need proteins derived from meat to survive. 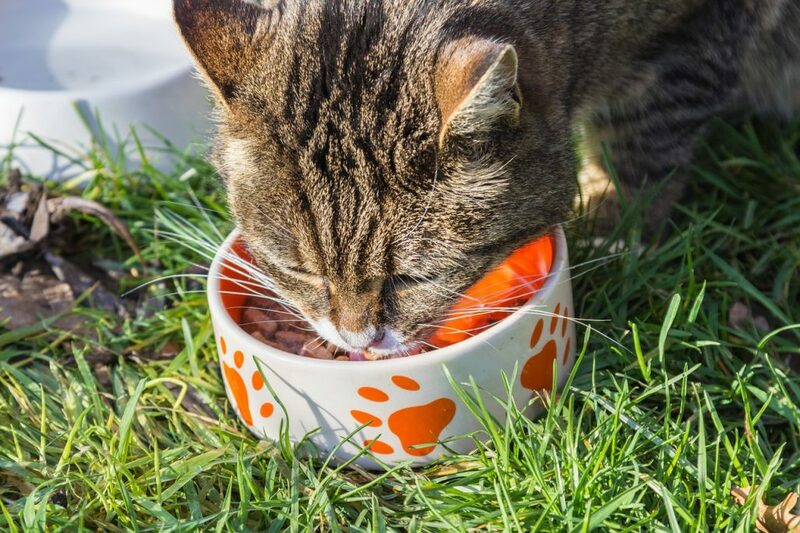 Unlike dogs, cats get basically all of their nutrients from proteins in the food. They also digest the fatty content in food. Carbohydrates and fiber, mainly derived from plants, are not present in the natural diet of a cat. A wild cat will eat the bones, muscles, and fur of prey. Wild cats only sometimes eat the entrails of prey, which contain partially digested plant content. It’s normal for a wild cat to not eat the entrails at all. As a result, cats have shorter colons compared to humans and dogs. Fiber and carbs take a long time to digest. So the food material doesn’t pass through shorter colons of cats like in dogs, which naturally eat both meats and plants. In simple terms, cats don’t need extra fiber in their diet to survive. In fact, cats mainly source their fiber from animals they eat. The main sources of fiber for a domestic or a wild cat are the bones and cartilage in whole meats. Cats also derive fiber from fur. Not just prey, a cat’s own fur can act as a source of fiber. Your pet cat spends most time of the day, after sleeping, cleaning itself. All that fur she cleans goes into the stomach, where it is digested as fiber. If cats don’t need fiber, why do some cat foods promote this substance? 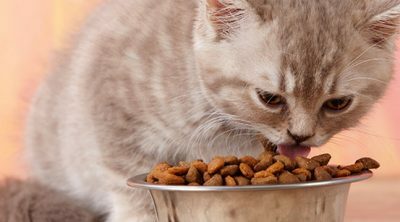 While cats normally don’t eat fiber, there could be medical conditions that require extra fiber in their diet. 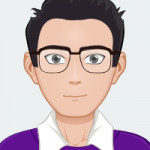 Read along to learn more. Commercial cat food doesn’t exactly mimic a cat’s natural diet. Dry cat food, for example, contains a lot of carbohydrates and fiber derived mainly from plant sources. 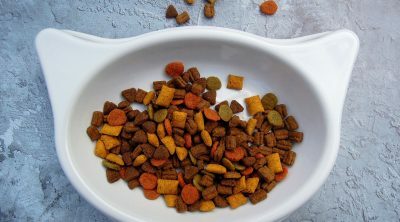 Wet cat food also may contain fiber and carbs from grains and fruits. If a cat food brand contains any plant or fruit material, then it definitely contains more fiber than your cat needs in its diet. 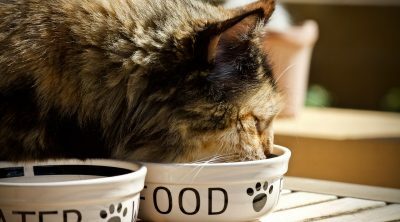 Commercial cat food with a “fiber rich” label may contain more plant material than usual. Cat parents must be very cautious before giving such food to your cat. You should first ask your veterinarian if the ingredients are suitable for your cat. If you do need to give your cat more fiber, look for cat food brands that contain lots of animal-based fiber. That is, look for bones and cartilage in the ingredients list. As a rule of thumb, animal-based ingredients are always the best for your cat. Health problems like diarrhea and constipation in cats are rather complex. Your vet will perform tests to determine the cause of the problem before recommending fiber-rich food. Obesity is a huge health problem facing domestic cats. People are often told to eat more fiber to shed excess weight? Does the same work for cats? The simple answer is, no. As mentioned earlier, cats cannot digest any plant-derived materials. So fiber like the fiber people or dogs eat cannot help cats. Fiber could actually act in opposition to weight loss in cat. High plant-based fiber content can prevent a cat’s digestive system from absorbing protein from food. That means the cat gets fewer nutrients from food. The cat would start losing muscle mass as a result. It puts the animal’s metabolic system on high alert. When the cat eats next, its body is more likely to store food than spent it, leading to weight gain. If you want your cat to slim down, veterinarians recommend a low-fat and low-carbohydrate diet. Pet owners should only include fiber in a cat’s diet only following recommendations from a veterinarian. As mentioned earlier, cat’s don’t eat plant fiber. Therefore, your veterinarian would recommend fiber-rich food only if your cat really needs it. 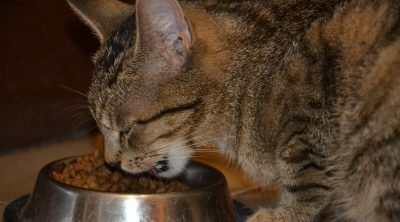 Rather than lack of fiber, cat owners should worry about excess fiber in cat food. Excess fiber can lead to weight gain in cats, and may even cause digestive issues (rather than fix them). Ask your vet if your cat needs more fiber in their diet. Otherwise, you may only harm your pet with ingredients they don’t need. Wet cat food is recommended for pets because of the high moisture content. But occasionally, you might want to give your cat dry food as well. 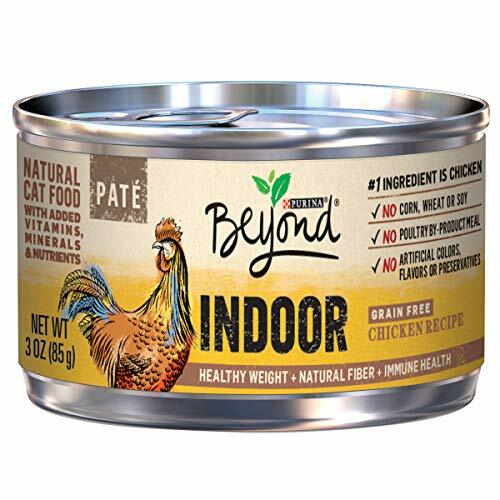 Dry cat food like this brand contains more fiber in general compared to wet cat food brands. This brand tries to recreate a cat’s natural diet into kibble as much as possible, according to the packaging. 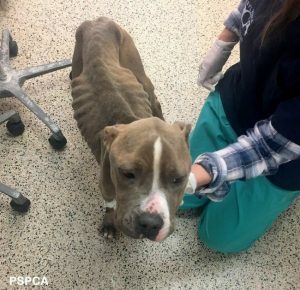 About 98 percent of this kibble is meat, bone, and organs, according to the manufacturer. The main ingredient listed is chicken, which is ground with the bone. Animal bones are a major source of fiber for cats, so this kibble can be highly beneficial for your pet. The other main ingredients include chicken liver and chicken gizzard. The primary vegetable listed is pumpkin seed. This brand contains no grains or glutens as fillers. Unlike most cat food products, the kibble include a bacterial fermentation product. The product is assembled in the USA, and the manufacturer claims none of the ingredients are sourced from China. The kibble is said to be minimally processed as well. However, as dry kibble, this product contains minimal amounts of water. If you are giving this to your cat, it’s important to make sure your pet always has access to clean water to prevent dehydration. This Purina wet cat food for adults contains no grains, animal by-products, soy, corn, or wheat. There are no artificial colorings, preservatives, or flavors either. The ingredients list is short and contains many supplemental essential nutrients. The main ingredient in this cat food is chicken, followed by chicken broth. Other ingredients include liver, ocean whitefish, powdered cellulose, carrots, and dried egg products. Carrot and powdered cellulose are the only plant-based sources of fiber. Pet owners should be aware that powdered cellulose is essentially wood pulp, most likely from pine trees. It’s very rich in insoluble fiber. However, your cat should get its fiber mainly from the listed meats. The nutrient breakdown for this recipe goes like this: 10 percent crude protein minimal, 5 percent crude fat, and 2.5 percent crude fiber. The moisture content is 78 percent, just like in a cat’s natural diet. The brand label says this recipe contains natural sources of fiber. But keep in mind that your cat might not be able to digest carrots or powdered wood pulp. There recipe includes a range of vitamins and minerals your cat needs to survive. It has added taurine, a nutrient cats absolutely need, as the last ingredient. Also, the price for a dozen cans is quite affordable as well. 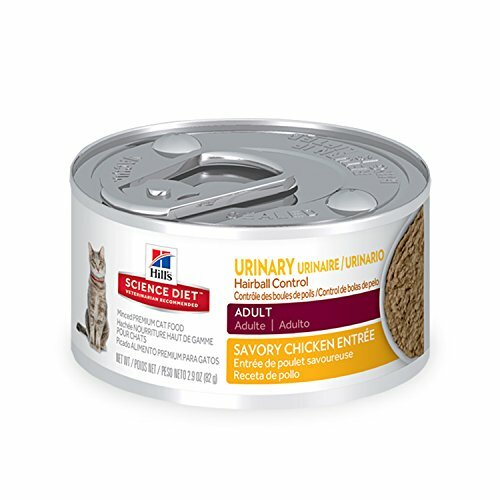 If your cat no longer likes seafood or meat recipes, you can try this turkey flavor version. The main ingredients in the recipe are turkey broth, turkey, chicken, and chicken liver. There are no grains or soy in the recipe, but there’s guar gum to add a good amount of insoluble fiber to the formula. This product does contains by products from poultry and meat. But these are not the main ingredients. There is also some added color. There are plenty of vitamin and mineral supplements as well. The recipe has extra fish oil as a source of omega-6 fatty acids for your cat. Your cat might benefit from food that isn’t packed with lots of vegetable and other plant fillers. There is fiber in the recipe, but it’s derived from a limited number of ingredients. All in all, this cat food recipe is worth a try for grain-free sources of fiber. Because of the primary ingredients, the recipe is protein dense. You can ask your vet if this blend would suit your cat’s fiber needs. 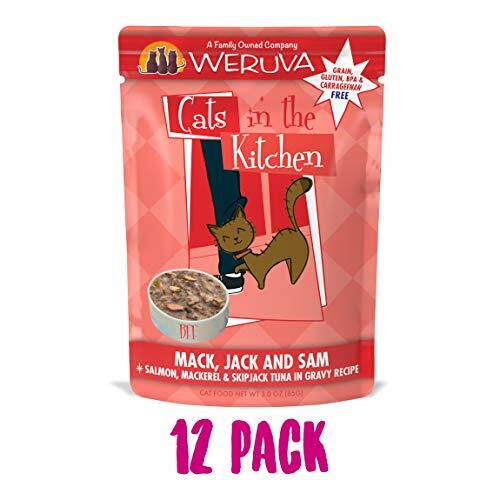 This rather affordable cat food pack contains three different flavors: Pumpkin Lickin’ Chicken, Chick Magnet, Love Me Tender, Pumpkin Jack Splash, 1 if by Land, 2 if by Sea, and Mack, Jack & Sam. The Pumpkin Lickin’ Chicken recipe is made mainly from chicken and pumpkin. Other ingredients include sources of insoluble fiber like tapioca starch and xanthan gum. The Chick Magnet recipe includes chicken and mackerel as main ingredients, followed by tapioca starch. Love Me Tender has the most meat ingredients, with chicken, tuna, and duck as main ingredients. The Pumpkin Jack Splash is mainly tuna and pumpkin. The “1 if by Land, 2 if by Sea” flavor is made from tuna, beef, and salmon. The Mack, Jack & Sam flavor has salmon, mackerel, and tuna—mainly a fish-based recipe. All the flavors have a crude protein percentage of 9 percent, and fat percentage of 1.4 percent at least. The main ingredient is water, which amounts to about 85 percent of the recipes. While the flavors are fun, each recipe has plant-based fiber sources like tapioca starch, gum, and sunflower seed oil. Your cat may not be able to digest some of these ingredients. This special label wet cat food recipe is recommended for adult cats between ages 1 and 6. 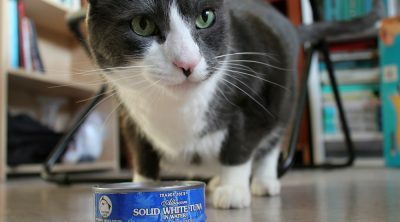 Though the label says it can help in treating hairball and urinary problems in your cat, you should always check with the vet before using this type of food. The ingredients list for the recipe is a mix of meat and a lot of plant-based fibers. The main ingredients in the recipe are water and chicken. The recipe then includes turkey liver, pork by-products, pork liver, and turkey heart. These are all really high-quality ingredients, except for the by-products. This recipe includes powdered cellulose, corn starch, rice, soybean meal, dried beet pulp, and several other plant ingredients. All these are top sources of insoluble fiber. The recipe includes a number of supplements, including magnesium, that supports good urinary health. 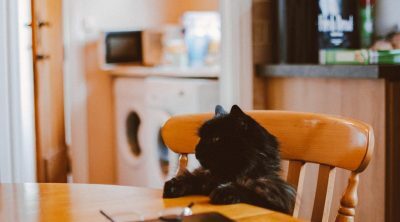 This recipe would be a good choice if your cat needs to eat a lot of insoluble fiber along with its protein requirement. 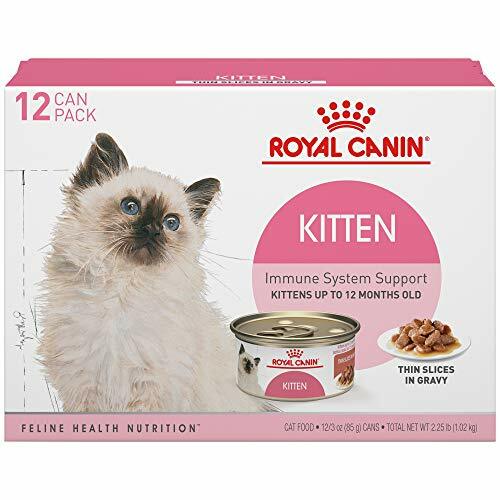 This is kitten food sufficient for kittens up to a year old. Each can contain about 78 calories. You can give this food to adult cats, but mind the calorie content if the adult cat is prone to obesity. This derives proteins mainly from chicken by-products. That means the recipe may contain bird parts like beaks and legs not included in a cat’s natural diet. Other protein ingredients include chicken liver, chicken, pork liver, pork plasma, and egg product. The label says the recipe is grain-free. However, the ingredients list includes brewer’s rice flour and wheat gluten. These are all sources of insoluble fiber. Other plant-based fiber sources include powdered cellulose, guar gum, and modified corn starch. Some of the ingredients in the recipe may not appeal to all cat owners. But the formula contains a solid ratio of vitamins and minerals kittens need, including taurine. The formula is mainly water, which is another important ingredient for cats. Your kitten may not yet drink water from a bowl. Cats naturally consume their daily intake of water from food. The price tag on this kitten food isn’t too expensive either. A pack of 12 costs about $15, which is in the affordable range for most households. 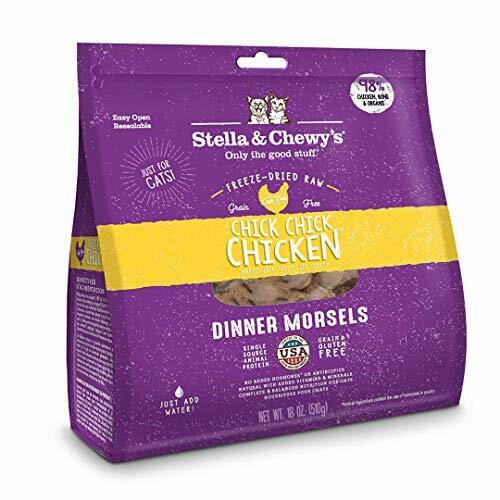 There’s an easy winner to the above roundup of best high fiber cat food recipes: Stella & Chewy’s freeze-dried dry kibble. The main advantage with this kibble is that it’s mainly made from high-quality animal meat. Cats can’t digest most plant sources of fiber. But it can easily digest fiber from bone included in this kibble. 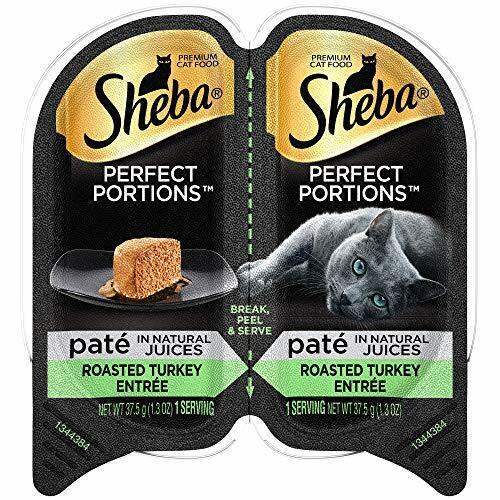 The brand assures pet owners that the kibble resembles a cat’s natural diet as much as possible. Your cat can benefit a lot from a grain-free diet like Stella & Chewy’s. High-protein recipes like this tend to go easiest on cat’s digestive system. There are other good choices to consider in the list as well. Cats can be picky eaters. So you may have to carefully choose the best recipe for fiber sources for your pet.